Have you been wanting to make a Triangle Baby Quilt? Triangle Quilts are sooo cute and modern! And they feature your fabric selection beautifully. We love Triangle Quilts so much and we are so excited to tell you that we’ve made a Triangle Quilt Class! 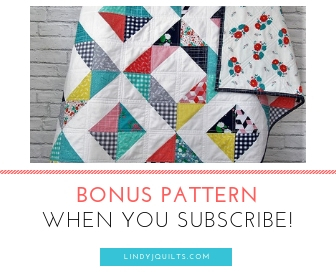 Mom and I have had the best time making you a series of videos that walk you through the entire process of creating a Triangle Baby Quilt and we offer you TWO ways you can access the class. Option #2: Use a Skillshare membership to access the course. So what is SkillShare exactly? Skillshare is an online community of all kinds of creators. These creators teach a wide range of classes. You’ll find classes for Creatives, Business Folks, Tech Peeps, or just General Lifestyle Gurus. On SkillShare, You can learn how to Decorate a Cake, Start a Blog, Learn Calligraphy, Take Better Pictures, or Make a Crib-Sized Triangle Quilt (sorry, just HAD to give our class a shout-out!) – there are so many fun classes available! As a premium Skillshare member, you have access to thousands of classes that you can watch and take at your own pace. It’s perfect for those of us who are busy, busy but always wanting to refresh a rarely-used skill or learn something entirely new. If joining a membership isn’t the right fit for you, we are offering our Triangle Quilt Class at a flat fee of $27 USD. Whether you opt for SkillShare or for Direct Purchase, you will receive a Triangle Baby Quilt class that will take you through the ENTIRE PROCESS of making a Baby Triangle Quilt. We will show you exactly what supplies you will need, fabric requirements, and all the steps necessary to make your quilt. Our classes are broken up in bite-sized step-by-step videos so that you can watch at your own pace. You can watch a class as many times you need until you are ready to move on to the next class. And if you follow each of our steps, you will finish a Crib-Sized Triangle Quilt. You will not be forced to watch us cut and sew an entire quilt!! Uh, boring. We really tried to condense our class into easily digestible segments so that you won’t be forced to watch us cut 100+ triangles, pin 200+ pins, or sew 1000+ seams. And our finished quilt from our class is available in our shop. For this quilt, we used a color palette of Navy, Teal, and Hot Pink with some White sprinkled in. Our triangles are 5″ high and the quilt measures 40″ x 50″. We use simple straight-stitch quilting in the seams and 1/4″ on both sides of all the seams. The quilt backing is a beautiful soft hot-pink and white chevron flannel back.This quilt will be a sweet addition to a little girl’s nursery. Mom and I had so much fun creating this Triangle Baby Quilt class and we are already starting the next one! Hopefully the class production process is a little faster and we learn even more on the whole video production process. Are there any quilting classes you’d like to see? Are there any quilting classes you’d personally like to teach? Feel free to leave a comment below or contact us and say Hi and tell us about you and your quilting projects. You are the best! Thank you again for all your support! Next Post The DL Special – A New Quilt Pattern Now Available!